TEACHERS! EDUCATORS! PARENTS! This book is filled with integrated curriculum ideas and resources! Here's the key to making memories your child will treasure forever: on just this one special day, out of all the days in the year, let your birthday hot shot take the spotlight. Let your child have all the power, make all the decisions and be first in every activity. I promise, taking the spotlight for an hour and a half or two out of all the hours in the year will not spoil your child! Your child's peers will not only accept the idea of the birthday child taking the spotlight, they will expect it because it's exactly what they want at their parties. They expect to: be the leader, be first at the games, lick the frosting off the candles, eat the first bite of cake, and keep the decorations from the top of the cake. Each child is a wonderfully special and unique individual. When you plan birthday parties consider and respect your child's personality and temperament. The party you think of as fun and exciting might feel overwhelming and too stimulating to your child. Customize the party to your child's age and stage --planning appropriate activities --and you and your birthday child will have fun! Beginning at age four, most children receive a great deal of joy and satisfaction from helping plan their parties. Talk to your birthday child about his or her expectations. Spend time together to go over each area that needs to be planned and organized. Pick a theme and decide on the games and activities. Include your child in all the shopping, too. My philosophy is simple: birthday parties are for kids --involve them, make them feel special. It's their day. I can't think of a better gift or a better self-esteem booster, than to say"I love you" by celebrating the day your child was born. When to have the party? The best days for parties are Saturdays and Sundays. If your child's birthday occurs during a school holiday or vacation, have the party before school lets out or after it starts up again. Be sure to keep the party separate from any holiday celebrations. The best times for parties depend on your child's age. If your child is three or younger, plan the party for before or after naps and meals. 11:00 am to 12:30 pm or 3:00 to 4:30 pm are usually good times. For ages four through nine, the prime times are 1:00 to 2:30 pm or 3:00pm. Two hours is the max for any age group. Where to have the party? My first-choice party location is outdoors -- whether it's a park, playground or your own backyard. I'm an at-home party advocate. In case the weather doesn't cooperate and the party must be indoors, contain the guests to one or two rooms, even a clean garage will do just fine. Keep the birthday child's bedroom off limits. Family rooms make good birthday party sites. They're often near the back patio or porch. I like to push the coffee table and other furniture to the edge of the room so I can go from active, outdoor play to indoor activities. If you want to have the party away from home, make sure the location is appropriate for your child's age and the age of the guests. Remember, you're responsible and liable for all the children in your care. For any party, any age group -- do not go to see a movie. Even if it's the latest, greatest, newest release, sitting in the dark and keeping quiet does not constitute a celebration. Who to invite? Let the birthday child decide who he or she wants to invite. You may feel all the children who have invited your child to their parties should be included. I don't think this should be mandatory, especially if your child's not particularly close to those children. I do suggest you include any of your child's siblings, either as guests or as helpers. Don't assume you have to invite the siblings of the guests your child is inviting. You need to keep the number of guests at the party to a manageable number and you want those guests to be your child's friends. Don't feel shy about saying"no" if a parent asks if it would be okay for the brother or sister to come too. How many kids should you invite? The rule of thumb is to invite as many friends as the birthday child's age. Not!! I suggest letting the birthday child invite 8 to 15 guests of similar age for the most fun. That may sound like a lot of kids, but think of it this way: besides being a time for fun and play, a birthday party is also an opportunity to develop social awareness. 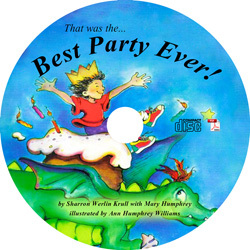 Parties help kids learn how to accept and enjoy others, give as well as receive, share and take turns, use good manners, and converse with each other and adults. If you're inviting more than four guests, always arrange help ahead of time. The younger the kids, the more help you'll need. The ideal ratio is one adult to every four or five children. Solicit help from spouses, friends, relatives or favorite babysitters. Invitations: Invitations must be mailed or hand delivered...whether store bought, computer-generated or homemade. Avoid hurt feelings -- don't distribute invitations at school unless you plan to invite the entire class. Send the invitations out three to four weeks in advance. There's nothing worse that receiving a last minute invitation --the recipient wonders if she or he's being invited as an afterthought or to fill in for someone higher up on the list that couldn't come, and the parents are inconvenienced by having to shop for a present on short notice. Be sure to include the following information in the invitations: who the party is for, date, start and end times, and always, always an RSVP with your phone number and the date by which you need an answer. If you don't hear from the invited guests/parents by the date requested, call them. Ask if they received the invitation. Tell them your birthday child would like to know whether his or her friend is coming. As the host, you need to know how many children will attend so you can plan refreshments, games, party bags, etc. The count will be critical for organizing as well as for budgeting party costs. Decorations: Keep Them Simple! Don't spend a lot of time or money on decorations. I suggest you hang streamers or let the birthday child draw pictures to put around the party area. Follow your child's lead. The process of doing is part of the fun and anticipation. Balloons go hand-in-hand with parties. Tie a bunch to the mailbox or a helium-filled balloon to each guest's chair. After the party, guests may take the balloons home. Prizes, Favors & Party Bags: Whether your child is two or nine, a party bag is a must. This is especially important for younger guests. Two year olds really cannot understand the concept of gift giving -- they want to keep and open the presents their parents have just wrapped for the birthday child. With party bags, everyone gets a gift. If your child is four or older, go shopping together. Let your child select the toys and candy for the party bags. Popular favors include small toys, trinkets, bubble gum and small lollipops. The favors you and your child select will vary depending on the age of the guests. Don't worry too much about the quality of the gifts and prizes; most small guests appreciate quantity more! You can assemble party bags ahead of time or fill a prize chest (a cooler, box or other container will work fine) with an assortment of small toys and candy. Let the guests pick a specified number of items from the prize chest to put in their party bags. If the birthday child is five, for example, let each guest pick five toys and five candies. Children really enjoy the power of choice. Party Hats and Blowers, No Thanks! I find party hats and blowers frustrating for adults as well as children. Not all children want to wear the hats and the elastic inevitably breaks on some of them. The adults end up scrambling to fix hats while they try to light the candles on the cake at the same time. Blowers are often poorly constructed. If you decide to use them, be sure to have extras on hand because many won't work properly. Also, you'll need to have the children get the blowers out of their mouths (which might not be easy if they're tootling away while you're trying to talk to them), so they can sing"Happy Birthday." Refreshments, Yum! Nutritionists tell us never to skip a meal, but I want to convince you not to serve a meal or even put out snack foods at the birthday party. Some parents think they'll fill more time by serving lunch or dinner. This isn't necessarily true: some kids won't eat anyway! Either they won't like what you're serving, or they'll be too excited to eat. As for snack foods (nuts, popcorn, chips and small candies), kids usually grab them by the handful and eat them on the run. This can create a mess and a safety hazard -- kids can easily choke if they're eating while playing. I suggest you to have the children eat and drink just once during the party: right after singing"Happy Birthday." The Cake, the Cake, the Very Important Cake! You can help your birthday child make a cake from scratch or from a cake mix. This could be a tradition you establish in your family. On the other hand, your child may want to go to the bakery and choose his own --from flavor, filling and frosting to decorations on top. If you want the freshest cake in town, order one with a whipped cream frosting and/or a custard filling. There's no way this cake can be made ahead of time and frozen. (I've found some bakeries do just that with a sheet cake. They pull it out of the freezer on the morning you plan to pick it up, then frost and decorate it.) What if your child doesn't like cake? No problem. How about cookies, cupcakes or the ever popular ice cream cake. Frozen yogurt pies also make a great alternative to cake. Ice Cream, you scream...we all scream for Ice Cream! Let your child pick the flavor. You may think it should be chocolate or vanilla, but if the birthday child says mint chip or orange sherbet, go for it. Here's a foolproof idea for serving that eliminates the struggle of scooping hard ice cream or the mess of soft ice cream. Scoop the ice cream into cupcake liners placed in a cupcake or muffin tin. Place the pan in the freezer several hours or a day or two before the party. Take the pan out of the freezer at cake cutting time for ready-to-serve scoops of ice cream. Beverages --NOT apple juice! Whoever thought of serving that with cake!? So many of us associate juice as the beverage of choice for children. But it really has no nutritional value! (Research is now showing it can stunt children's growth, contribute to childhood obesity and promote tooth decay) And how many of us adults would pick that beverage to drink while eating cake?!! Please do not offer it at a birthday party. The one beverage I've never seen kids turn down is Cherry 7 Up. It has no caffeine and it doesn't stain. When serving, fill the cups only half full and take the beverage to the guests. Another good choice is milk. Nothing goes better with cake. Or how about water? None of us seem to drink enough of it, including our children. In fact, make it available throughout the party. Sugar Highs? It's a Myth! How many times have you heard the expression,"Just wait till you see the kids after the cake and ice cream --they'll be bouncing off the walls!!" If you didn't notice, they were that way when they entered the party! Just anticipating the big event or being at the birthday party is a high in itself. Sugary foods get the blame for causing children to become hyperactive at parties but recent research indicates sugar does not increase aggressiveness or physical activity in children. The most likely culprit is the caffeine in the cola or chocolate! Planning the Party Agenda: The party will last one and a half to two hours. You'll need to plan lots of activities to fill the time. I usually start with a half hour of arts and crafts, continue with a mixer, go on to non-stop fun activities, cake and ice cream, present opening, then before you know it, the party's over! Games & Activities: Every Child's a Winner! Have you ever watched children play Pin the Tail on the Donkey? Everyone laughs at the uncoordinated kids with no sense of direction who miss the target by a mile. Those kids may be good sports and join in the laughter, but inside they may feel embarrassed and humiliated. Or how about Musical Chairs? When the music stops, the kids push and shove to get to a chair. The first loser sits out all alone. As the game continues, the kids get more and more aggressive. They stop at nothing to be the winner. In the meantime, the losers feel left out...some of them are in tears. These games are prime examples of competitive games and the reason I only recommend cooperative games, where every child's a winner. Competitive games pit children against each other. They teach children that, if you shove, push, hit or trip, you might beat the other players and win. There's just one winner and a whole bunch of losers. Children play games to have fun and be involved. They don't want to be eliminated, rejected, left out or hurt physically or emotionally. (Who does?!!) Cooperative games include everyone. Every child is in, there's no pressure to win, no fear or anxiety about losing. Cooperative games make kids feel good about themselves and others. They promote self-esteem, sharing, kindness and teamwork. High Drama --Serving the Cake: Here's the ceremony I use to serve the cake. Seat the guests around the tablecloth you've placed on the ground or a table. Serve each guest a half cup of Cherry 7-Up or another beverage. Refill as necessary. Walk around with the cake to let each guest preview it. This satisfies everyone's curiosity, not just the few sitting near the birthday child. Everyone wants to see what the cake looks like and the birthday child will be pleased to show off the cake he or she picked out or helped make. Have the birthday child put the candles on the cake. Ask the birthday child if she or he would like the lights on or off when blowing out the candles. Most three year olds want the lights on, while five year olds must have the lights off. As you light the candles, count each one in unison with the guests. Lead the guests in singing a rousing"Happy Birthday." Suggest the birthday child make a wish before blowing out the candles. Give the birthday child permission to lick the frosting off the candles and the decorations. Let the birthday child keep the decorations. Take the cake to a nearby counter. Cut small pieces to avoid waste. If guests start asking for a certain piece of birthday cake (e.g. the one with the flower on it), remind them that they're guests at the party and will eat what they're served. It's okay if they want only ice cream and no cake. Just make sure you don't end up being a short order chef, catering to each guest's individual desires. Serve the birthday child first, then the other guests. Explain to the guests that they must wait for the birthday child to take the first bite before they begin eating. This is good manners and party etiquette --the host always takes the first bite to signal that everyone may begin eating. When the children have finished eating, ask them to clear their places. Have them pour any liquid left in their cups into the sink or an empty bucket. Provide trash cans or bags and ask them to throw paper products and leftovers away before leaving the eating area. Opening Presents -- The Center of Attention! How many parties have you attended where guests shove the presents into the birthday child's lap and make present-opening a popularity contest or even a competitive activity? Manners are virtually lost and barbaric, uncivilized tendencies take over as children lose it all in a present-opening frenzy. Many parents want to skip the present opening altogether for this very reason. Please reconsider, though—many guests have painstakingly chosen the perfect present and perhaps made their own greeting card. Sometimes opening presents is the first thing the birthday child wants to do. I believe it's important to get the guests involved in the activities of the party itself first--whether those are painting, making party bags or stringing necklaces. As guests arrive, designate a place for them to put their presents such as a table, sofa, or corner of the family room. Even a laundry basket or empty box will work. If you follow a few simple guidelines, opening presents can be a smooth and pleasurable experience for kids and adults. I suggest making it a game which involves everyone. You'll need a trash bag, a toy or stuffed animal chosen by the birthday child, CD player and CD with the birthday child's favorite song, and children's scissors for cutting ribbon and ties. Explain the rules of the present-opening game to the guests and the birthday child before you begin. Ask the guests to sit in a circle with their gifts behind their backs. Seat the birthday child in the middle of the circle. An adult or older sibling turns the music on. While the music plays, the guests pass the toy or stuffed animal around the circle. When the music stops, the guest who is holding the toy gives his or her present to the birthday child. The birthday child reads (or is read) the card, opens the present and then, after admiring it, passes it to you. Hold the present up so everyone can see it. Explain that presents will not be taken apart, assembled, passed around or played with at this time. (Let the birthday child be the first one to take the presents out of their packages and play with them). Put the present aside and the wrapping paper in the trash bag. An adult helper records who gave what gift. This makes the task of writing thank you notes much easier. Before the music starts again, the birthday child makes eye contact with the guest who gave the present and says"Thank you." This is easy to remember as that guest is still holding the toy or stuffed animal. After the guest says"You're welcome," the music starts again and the guests continue passing the toy or stuffed animal around the circle. The present-opening game ends when all the gifts have been opened. It's Time to Say Goodbye: Parents will start to arrive to pick up their children as you finish up the last activity of the party, opening presents. They will be amazed to witness the orderly and organized present-opening game. They'll wonder if the party was always so calm (and of course it was!) and how you did it. Remind the guests to retrieve their party bags and any other art creations they made. As each guest leaves, have the birthday child thank him or her for coming to the best party ever! Why Kids Love These Parties! Get Ready! Get Set! Let's Party!! PLEASE NOTE: US ORDERS ONLY . International orders may be arranged by contacting us .